A few nights ago, I was in the mood for a ‘one dish meal’. I didn’t want a lot of clean-up for my poor hubby (yes, I cook, he cleans) and yet I didn’t want a traditional casserole. Poking around the internet, I found quite a few recipe sites that had great suggestions for the ingredients that I had, but it was a series of sites suggesting an old campfire method of cooking food that intrigued me the most. These sites suggested “meal bundles” wrapped in foil packs. Traditionally, these would be cooked over a campfire, but people have adapted this method for the barbecue, the indoor grill and even the oven. Some were a combination of vegetables, chicken and stove-top stuffing, while others suggested a base of potatoes or rice. Rice! That’s what we hadn’t had in a long, long time. The sites I visited suggested topping the food with cheese or ranch dressing. I had some chicken gravy, so I thought I might use that instead. 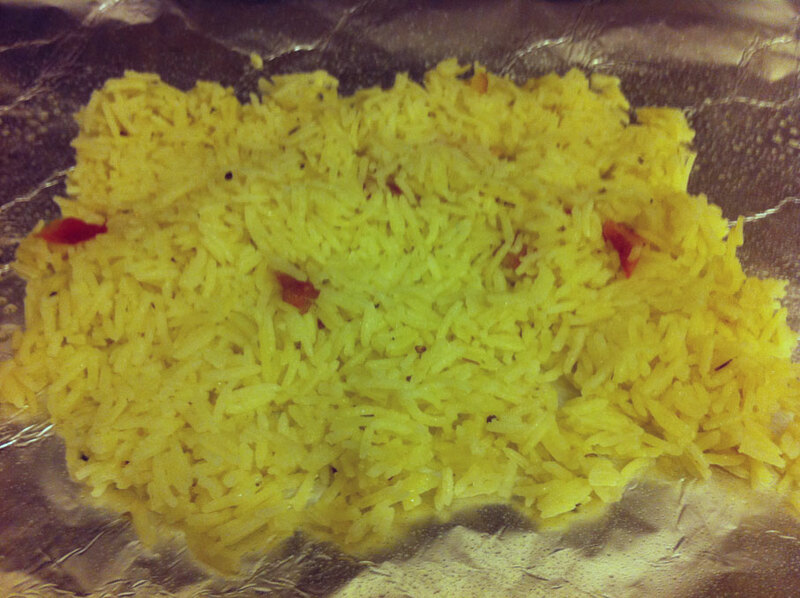 I cooked up some Basmati rice in chicken broth with some seasonings (oregano, a touch of sage, a little salt, etc.) 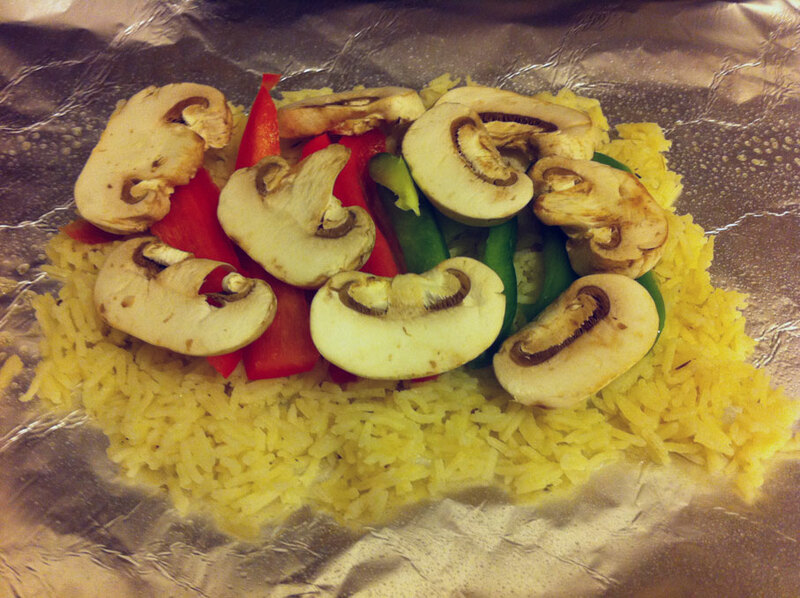 in one pot and started cutting up what veggies I had (a green pepper, a red pepper and a package of mushrooms). was it safe to cook these with raw chicken in the bundle with the rice and vegetables? To address the first issue, I sliced up each breast into long strips, eliminating that worry. The chicken would definitely cook thoroughly that way. As for the issue of contamination, there seem to be two camps online: those who say it would be safe and those who say it isn’t, and to cook the chicken before placing them in the bundles. The issue I had was that if I cooked the chicken ahead of time, as well as rice, what was the point in putting it all in the oven, other than to cook the veggies? And there were quicker/easier ways to cook the veggies. Many of the recipes I found said to use the raw chicken. And I considered how it would be done over a campfire: everything would probably be added to the one package of foil. So I made the decision to cook the bundles with the raw chicken inside, instead of pre-cooking. Sear the chicken in a pan on the stove before putting it in the oven, finishing its cooking in the bundles. This will seal in the chicken’s juices and prevent any issue of contamination. In hind-sight, I should have done it this way, as I was in doubt about how to proceed. We didn’t have any ill health after eating these chicken bundles, but next time, to put my own mind at ease (and to add a little more flavour! ), I will at least pan-sear the chicken before building the bundles. Assembling the bundles might seem simple, but there are a few things you need to do in order to ensure you don’t end up with a sticky mess stuck to the inside of the foil or leaky bundles letting food escape into your oven. 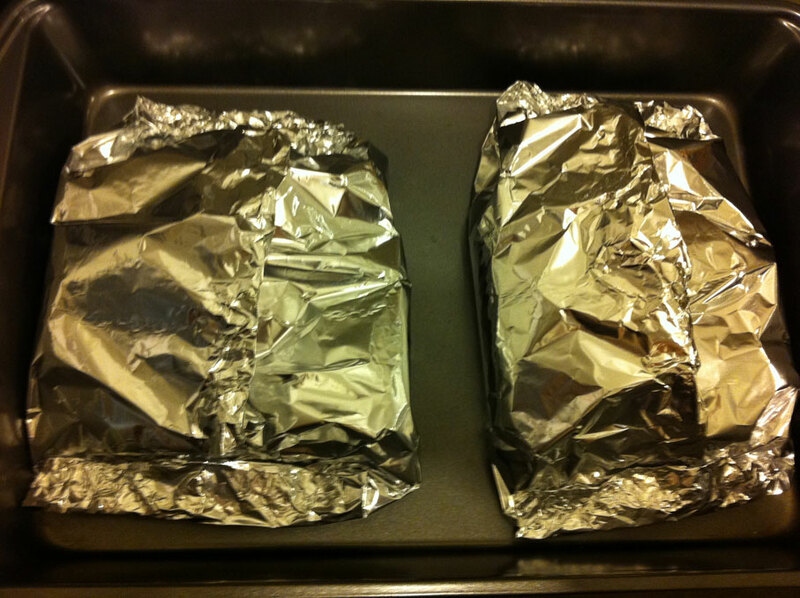 Make sure the pieces of foil that you use are large enough and the same size. You’re going to need to fold these bundles in half and then tightly roll, twist and pinch the edges together to prevent spillage. I made sure that the length was at least twice as long as the width. Also, make sure that you either spray the middle of the foil where you’re going to layer the food with some non-stick cooking spray. If you don’t have that, brushing it lightly with a little oil will work. 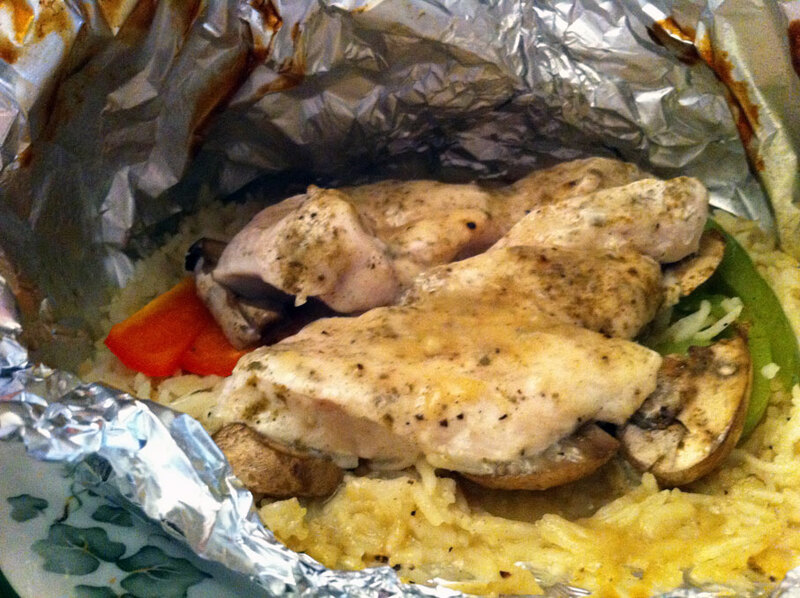 This will prevent food from sticking to the foil. When closing up the bundles, some sites suggest putting the food on one side of the foil, folding the other side over top of this, then closing up the three sides. Instead of that, I put the food right in the middle of the foil so that the third edge was closed over the top of the food, leaving less chance of a seam bursting and spilling (two seams laying flat rather than three). Have a look at my packets photo for a better idea. Be sure to fold the edges at least three times, twisting a bit if you can, then pinch them down to make sure they don’t just come open. 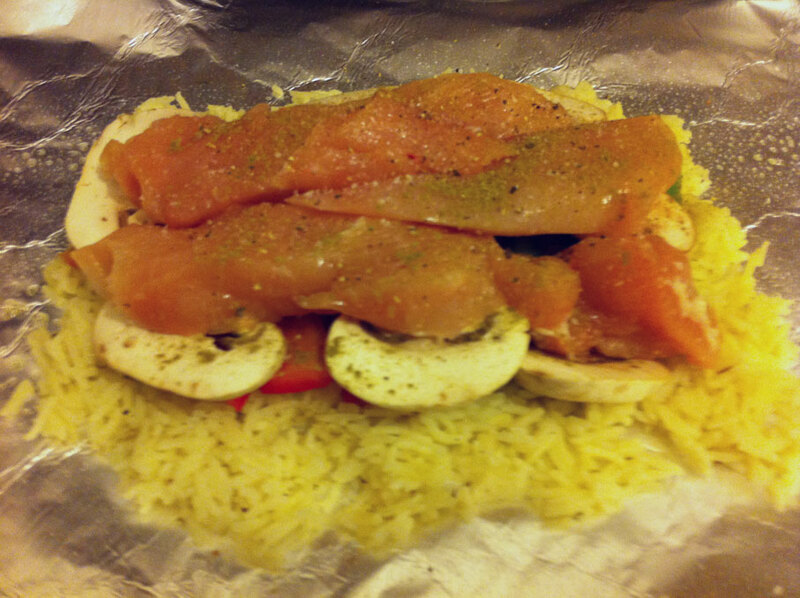 I layered mine with the chicken-broth rice, then green and red pepper strips, then mushroom slices and then the chicken. I seasoned the chicken with sea salt, freshly cracked black pepper and powdered sage. I then spooned some of the gravy over the chicken to cover it and then closed up the bundles. The other important thing to do is to put the bundles on a cookie or baking sheet or in a cake pan at the very least, just in case there are any spills. Next time, I think I’ll try something with potatoes, chicken, broccoli, cheese and bacon, inspired by a recipe on allrecipes.com that suggests using Stove Top dressing; I’ll just swap out the stuffing for sliced potatoes and maybe forgo the ranch dressing. Sorry, I’m not a ranch dressing fan. (And yes, I will be pre-searing the chicken in a pan or my indoor grill, I promise!) I think that marinading the chicken beforehand would also work well for this, but I did what I could in a short time frame. For the record, opening one up the next day and pouring it into a bowl or plate made for an easy way to re-heat in the microwave (don’t put foil in the microwave!). So lunch at work the next day was easy-peasy. This entry was posted in dinner, experiments, Lunch, one-pot-wonders and tagged bell peppers, broth, chicken, gravy, mushrooms, oregano, peppers, rice, sage. Bookmark the permalink.